Fine Silver Products offers human wellness items; clothing, antimicrobial wipes and other products, i.e. animal wound care products. All made from silverized fabrics and yarns for effective protection. Silver is a time-tested solution to many of life's daily concerns! Silver kills a number of bacteria, including those that cause odor, has excellent thermal properties, and is nontoxic. Over the past six thousand years, many civilizations have recognized the healing properties of silver - starting with the Macedonian culture which used it to cover wounds. Silver colloids were listed in the PDR (Physician's Desk Reference)until 1955, however the traditional medicinal uses of silver rapidly disappeared as antibiotics were introduced. Today, the use of silver is having a renaissance due to concerns about antibiotic-resistant microbial strains. How Silver is added to Fine Silver Products' base materials? The silver layer on the yarn fiber/fabric substrate is 99.9% pure. Silver is a naturally occurring element and there are no added artificial chemicals that may cause fear of toxicity. The silver is irreversibly bonded to the polymer yarn and does not wash out. For example, SILVERELL textiles have been tested after more than 250 washes without reduction in antibacterial effects. Wash Fine Silver Products clothing according to instructions and the silver layer will continue to work for years to come. For a detailed explanation of how silver works, visit our Silver Information page. Need something you don't see in our store? Please Contact Us. We have sources worldwide that make unique products with silver and copper plated fabrics and yarns. 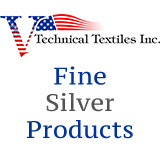 For additional plated conductive textiles and yarn options please be sure to visit Fine Silver's parent company - Sheldex U.S. at www.shieldextrading.net.